While staking out the Penguin Catwoman and whatshisface witness a Talon attack. The Talon, who is the original owner of the knife Catwoman is trying to steal, holds off on his attack once he notices the knife. Catwoman is able to promise to get the rest of the set to him, just as the Penguin shoots the Talon in the face. With the Talon dead, Catwoman leaves his body by the batsignal, which she turns on to alert Batman to the presence of the corpse. I’m going to assume that the batsignal being fixed is something that happened in another issue of the Court of the Owls event. I am also going to assume that this issue of Catwoman took place later on in the story. I’m sure it’s not a case of writers not talking to each other. It’s hard to comment on the individual issues in the Court of Owls event. Mostly because most of them are one shot stories involving the characters fighting Talons. Entertaining enough, but not exactly substantial. For a one-off story I have to admit that this might be the story I enjoyed most. The main reason for this was because I really connected with the Talon in this story. He just wanted his knives back, I can relate to that. In all seriousness though, out of all the Talons he seemed the most human. He had fallen into dishonor because he insisted on giving his target a fighting chance. Doing this had him caught by British soldiers, who he then murdered at the cost of losing one of his knives. When he confronts the Penguin he sees the knife and considers retrieving it a way to redeem himself. The focus on his own tragic redemption quest really helped the story stand on its own. I also appreciate that the story was set up outside of the event, with last issue being used to set up the job that Catwoman was on, rather than just having her run into a Talon randomly. While I’ve complained about the characters not mingling between books, in this case I’m fine with Catwoman not interacting with the rest of the Batman cast. Her book is very much a solitary event, with her standing on her own. She’s still a crook, not yet the part time hero she became in latter years. So I can understand why she doesn’t interact with the others. 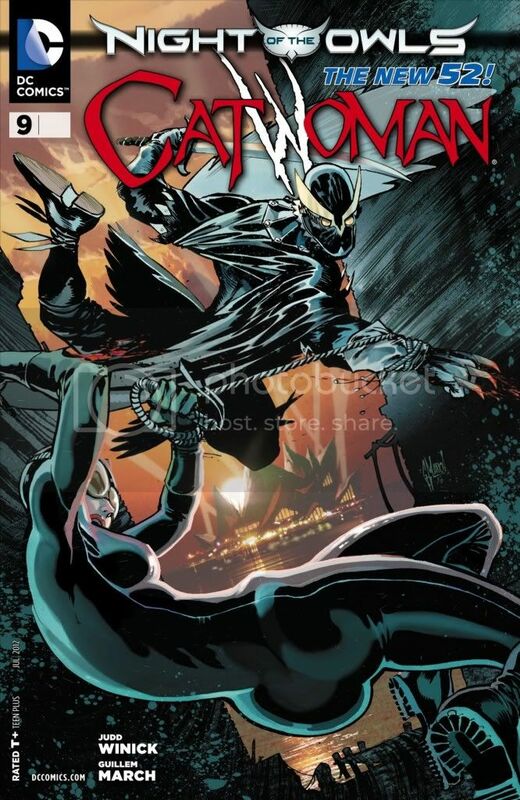 I would have to rank issue nine of Catwoman as one of my favorites from the Court of Owls crossover. If I’m going to be reading a oneshot fight issue then I’d at least hope for an entertaining story. Which is what I got. So no complaints from me here.